Pharmacy technician training at NMMU received a boost through a twinning agreement with America’s St Louis College of Pharmacy (SLCP) strengthening curriculum and mentoring our staff. At the signing were with (back Pharmacy’s Teri-Lynne Fogarty (back from left) and Pharmacy Department Head Dr Shirley-Anne Boschmans with (front) American International Health Alliance’s John Capati, acting Vice-Chancellor Prof Thoko Mayekiso and St Louis’ Prof Ken Schafermeyer. 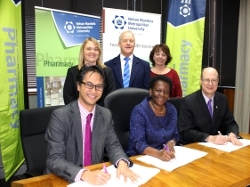 NMMU recently signed a twinning agreement with America’s St Louis College of Pharmacy (SLCP) to strengthen South Africa’s pre-service training capacity in the discipline of pharmacy care. Three pharmacy professors from St Louis in Missouri visited NMMU to help set up a training programme for pharmacy technicians to address the country’s HIV/Aids epidemic. Professors from South Africa will also visit St Louis. Research shows that South Africa needs about 2 500 new pharmacy technicians each year to meet the demand for HIV and Aids drug distribution and medical care. NMMU is the first university to train pharmacy technicians and presently has 69 students. The new qualification is a one-year certification programme that enables graduating technicians to deliver care with limited supervision and will provide the healthcare system, and pharmaceutical services with much needed pharmacy support personnel. “This partnership’s aim is to support NMMU in strengthening its curriculum and building capacity by mentoring the staff of the department to develop their expertise in the teaching and assessment of students while ensuring the quality of experiential learning provided to students, says SLCP International Programmes Director Prof Ken Schafermeyer.